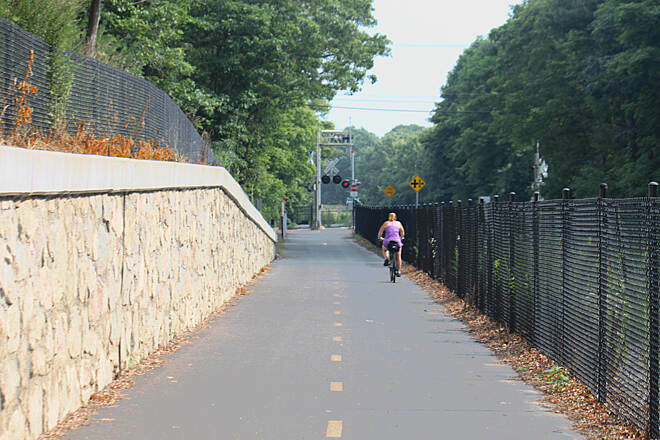 The Shining Sea Bikeway follows the route of a former railroad line run by the New York, New Haven and Hartford Railroad Company, which ran service to New York and Boston from 1872 to 1965. 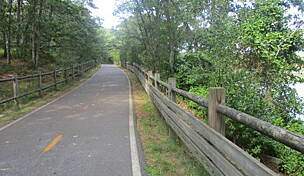 After the railroad company discontinued service along the line, local residents Joan Kanwisher, Barbara Burwell (mother of Rails-to-Trails Conservancy’s cofounder David Burwell), and several other supporters organized in a nine-year-long effort to have the village of Woods Hole acquire the land and build a trail, which officially opened in June 1974. 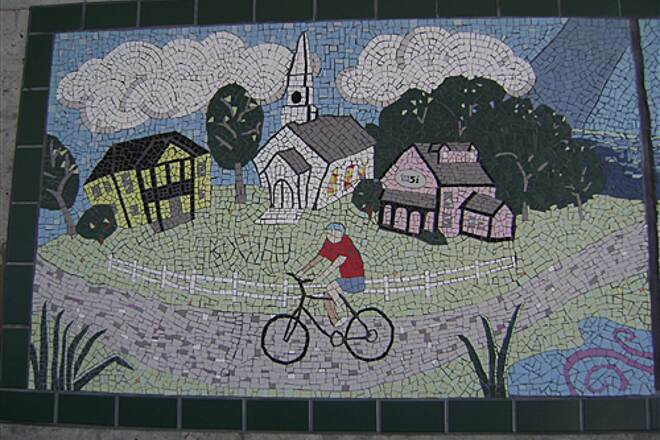 It’s no wonder that the bikeway was named after the lyrics to “America the Beautiful,” written by Falmouth native Katharine Lee Bates. 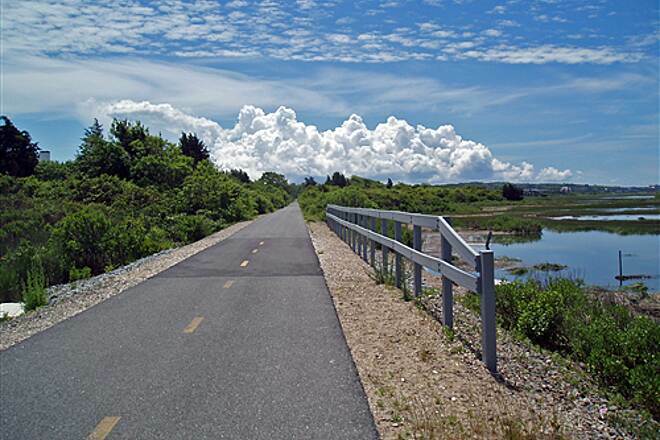 The 10.7-mile Shining Sea Bikeway—the only bikeway on Cape Cod to feature a seaside section—boasts beautiful vistas of marshes, rivers, and the sea. 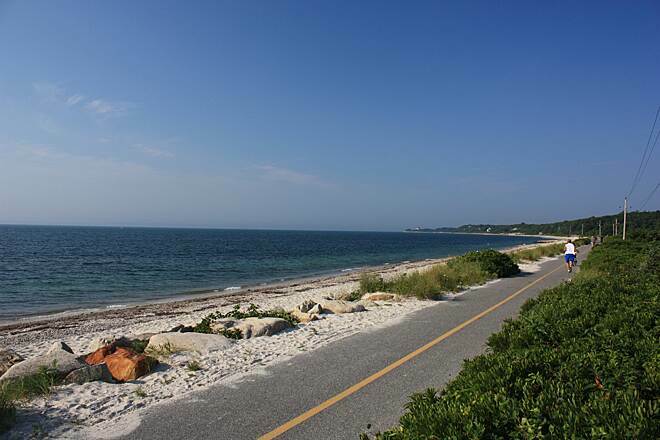 Although parking is available on either end of the trail, you’ll want to start your journey at the Depot Road trailhead along County Road in Falmouth, as the scenic payoff for your efforts is located at the southern endpoint in Woods Hole. Turn left out of the parking lot on Depot Road (across from Pine Street), and use the sidewalk to travel 150 feet before using the crosswalk to enter the trail on the opposite side. Along this stretch of trail, you can see railroad ties to your left—a nod to the trail’s railroad history. 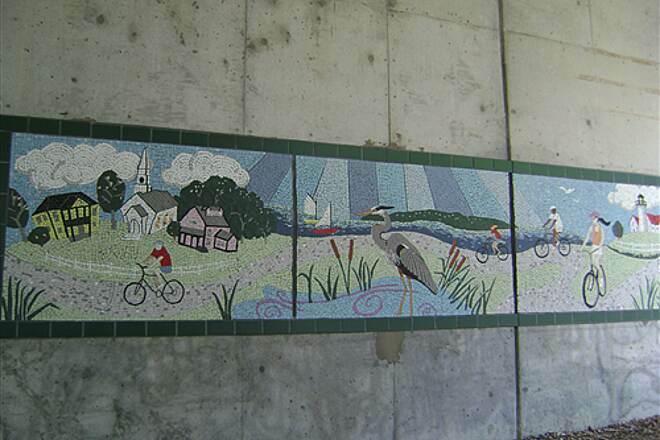 After crossing Winslow Road in 0.6 mile, the path enters a wooded area and goes through an underpass decorated with bike-themed murals from the AmeriCorps Cape Cod program. 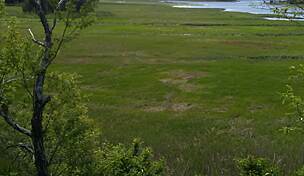 About 4 miles in, you will reach the Great Sippewissett Marsh on either side of the trail. 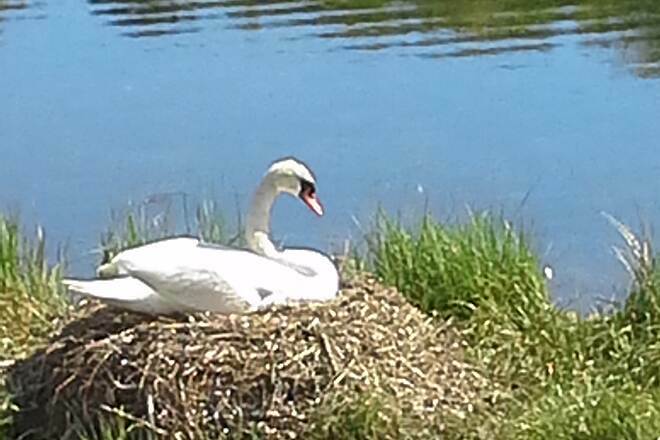 The saltwater marsh is an important ecosystem habitat for the local flora and fauna. 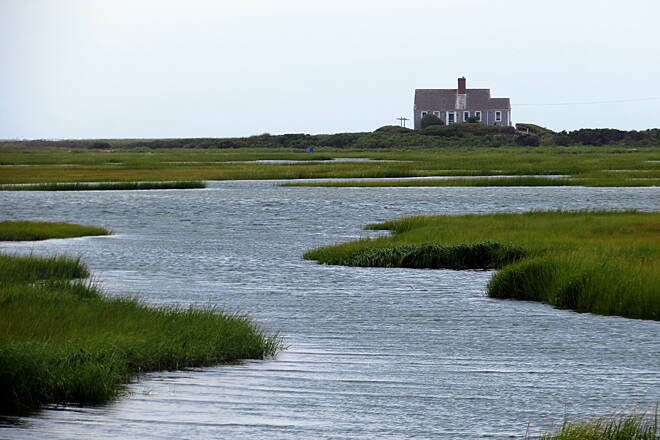 The Little Sippewissett Marsh is 1.3 miles farther ahead, and a connection to the Sippewissett Campground for backpackers is located on the left. 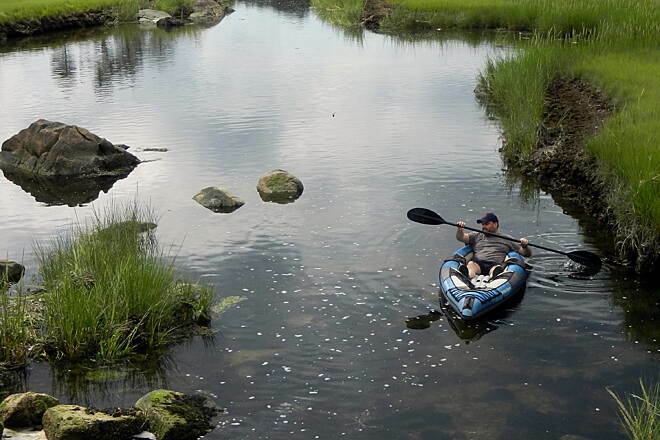 The word Sippewissett, meaning “little river,” comes from the Wampanoag tribe, the original inhabitants of the area. 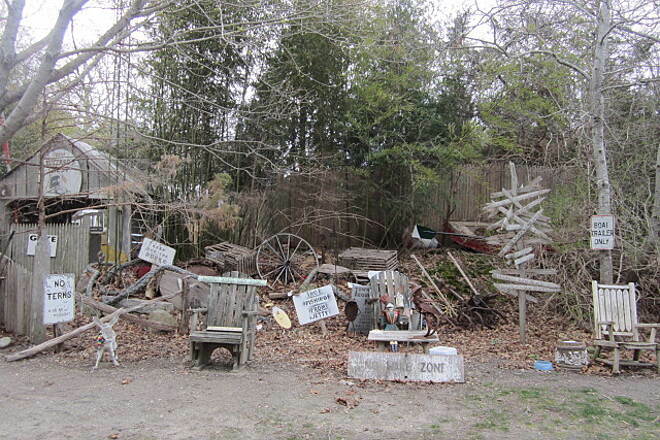 The trail continues through a wooded area, with trailside businesses dotting the landscape. In 2 miles, as you near Depot Avenue/Highfield Drive in Falmouth, you will find plentiful parking in multiple lots. You will then pass a bus station on your left before crossing the road to enter another trailside parking lot. The trail continues into another wooded area (Beebe Woods), occasionally intersecting streets with light traffic. At 8.5 miles into the trail, your hard work will be rewarded with stunning vistas of the Atlantic Ocean to the left as you pass by Surf Drive Beach. This makes for a perfect stopping point to rest and admire the ocean—or even take a dip in the water, as the swimming beach is fully accessible to visitors. After leaving the unforgettable views of the ocean, you will pass through a final wooded section that belies its suburban neighborhood with the sound of cars passing on nearby roads and houses located on the left side of the trail. As you cross a short bridge and pass through a long, linear parking lot, take care, as from here to the end you may encounter cars along your route. After crossing the Church Street overpass toward the end of the trail, you will find Little Harbor, docked with yachts, to your left. 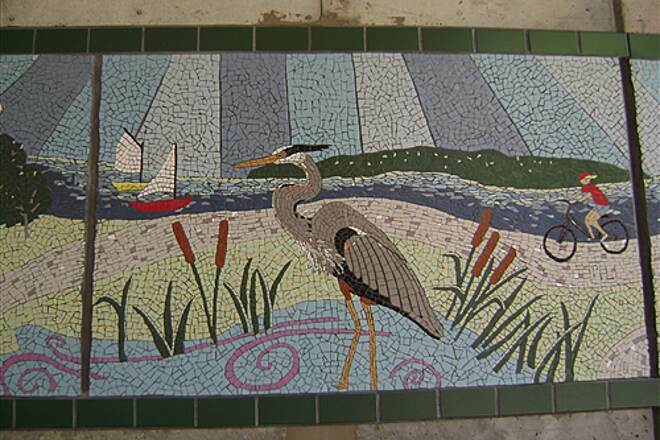 In 0.3 mile from Church Street, continue under the Crane Street overpass to reach the end of the trail. 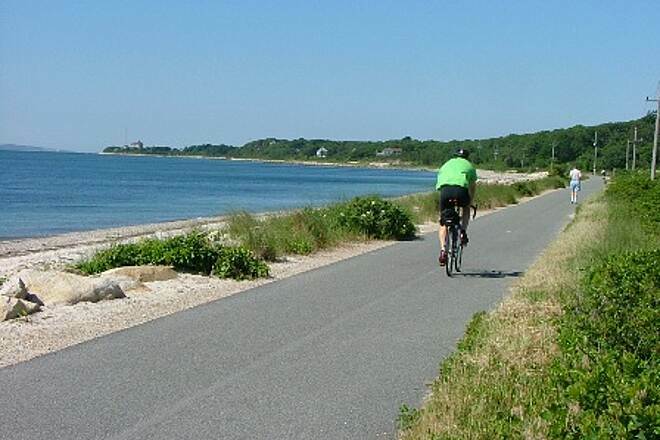 Friends of Falmouth Bikeways—and Friends of the Bourne Rail Trail—hope one day to extend the trail north to connect to the southern end of the Cape Cod Canal Bikeway in Bourne. Rode this on 7/16/17...my wife is not a big bicycle rider and she loved this trail. The length is about right for her to feel she got a nice ride in, and pretty flat. We started at Falmouth Village/Depot Ave (#7 on the map) and rode up to the top (#16) to meet some friends. We then rode down to Woods Hole. A friend who was on earlier than us (we started ~8:40) said they had been unable to continue through to Woods Hole due to a triathlon. But by the time we rode it was fine. I would also recommend a clear sign to get over to Nobska Lighthouse. Some of the group had wanted to detour but missed the turnoff. June 13th 2017 - Great trail to spend some time on. Easy to find. Most Parking lots have Porta potty. Parking lot at North end of trail has a couple of pot-holes left over by the retreating glaciers. Trail surface is mostly smooth asphalt. Some tree root damage in places. As you get closer to Woods Hole the trail is busier. You get to ride thru a couple of parking lots for the towns. Watch out for cars and shuttle buses. Spend some time exploring the towns along the trail. Find a beach and relax. Things to do abound. 11 miles down and 11 miles back. 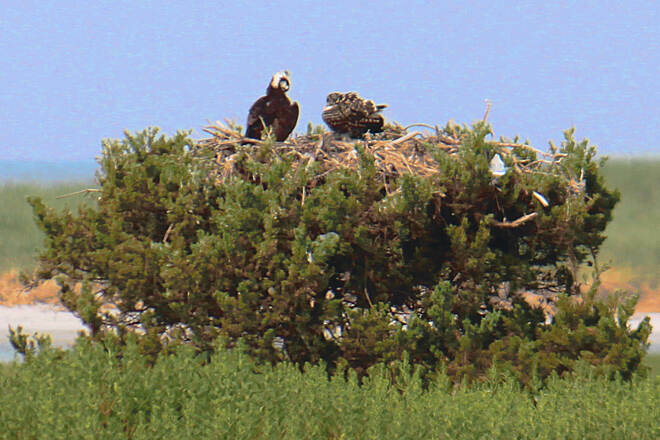 Great views and wildlife. Working bogs in the fall. Plus great coffee shops, restaurants and bathrooms in Woods Hole. I think the trail is great for riding or walking. I finally ended up parking in North Falmouth on County Road. Parking at Depot Ave seems easy too. I found it hard to find the parking on Oyster Pond Road and Elm Road. 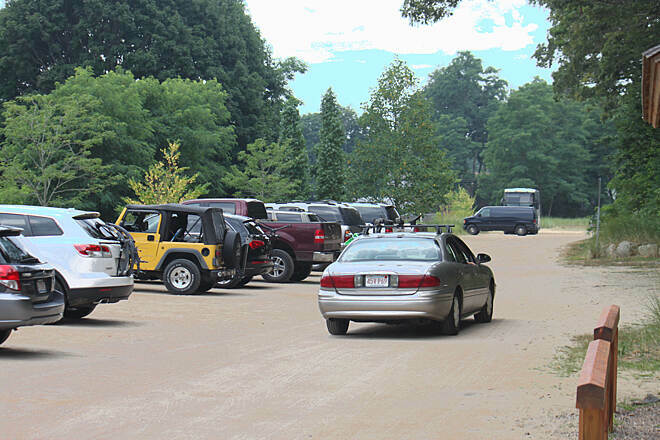 Woods Hole does not have much street parking if you plan to use the trail in the summer. Overall, I thought the trail was great. Nice scenic areas: the bogs, marshes, ponds and woodlands. 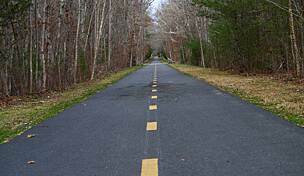 If you park in North Falmouth or Woods Hole, you have almost an 11 mile end to end trail. A 22-mile round trip is well worth the time to get there as so many other trails are much shorter. I enjoy running and land paddling on the trail. I've never found it overcrowded, and there are some really nice views along the way. Beautiful, quiet flat ride along the seashore. 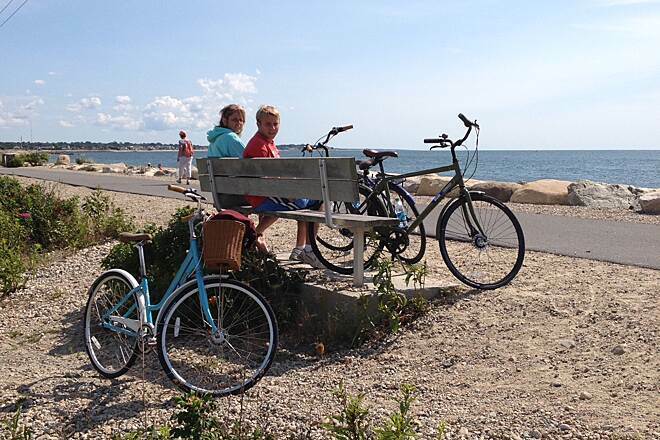 You can even bike to Falmouth center. Perfect if you like the beaches and ocean. Great condition. The Shining Sea Bikeway has been undergoing some repairs, most of which have been completed. There are a handful of bumps on this 10 mile trail that have minimal effect on the bike ride. 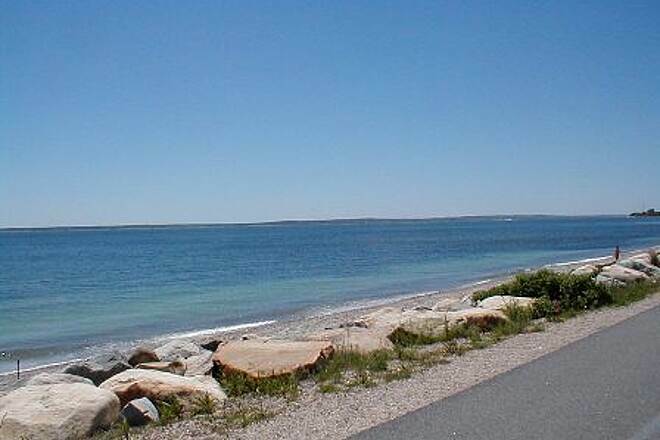 To make this ride much more enjoyable one can leave the trail and ride along the ocean on quiet Falmouth streets. There is an abundance of spectacular sights, that slow the rider often, to take photos. There are also some crazy sights on the path itself. 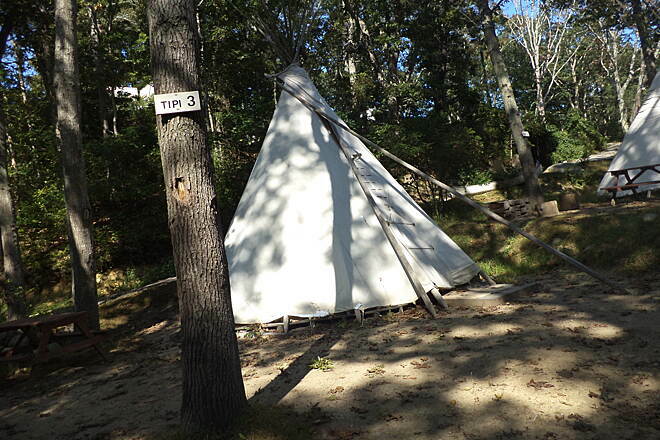 For instance there is a camp ground with three very large tepees and a working soda machine sitting all by itself kind of in the middle of nowhere. 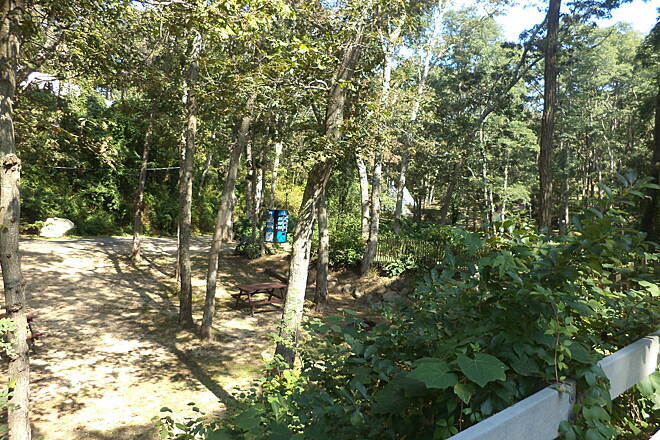 Wood's Hole at the end of the path is a typical quaint New England coastal town offering a variety of lunch choices. Naturally lobstah and chowdah are offered at most places. My preferred lunch spot is the Wood's Hole Oceanographic institute cafeteria where one can rub elbows with scientist from all over the world. Some famous and some (most) not so. Today's ride is also written up with a link to photos at the link below. Between the many bumps in the path from tree roots, to a detour on the path, The Cape Cod Canal path is a much better ride. Shining Sea Path is good for a recreational ride, not a good cardio ride. Too many stops as you cross roadways. Nice riding by the cranberry bog and ocean but pales compared to the views at the Cape Cod canal. No desire to ride the Shining Sea pathway again. Great trail with nice views of marshy land and beach front. Some places have rough patches due to tree roots. Good parking places and overall a great trail. I rode the trail today and loved it! This trail has just about everything you would need or want to see along the way. There are so many things to discover and areas to explore, you would need to take the ride several times. It is great for everyone! My favorite by far in this area. I can't wait to go back again. 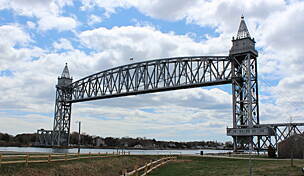 I hope that there are plans to extend this to the Cape Cod Canal, however, until then this is beautiful! 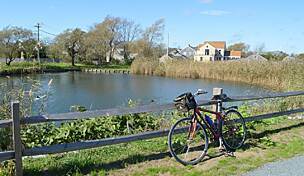 Nice ride, beautiful scenery through farms, marsh, along the ocean and right down to Woods Hole which is nice to walk around. 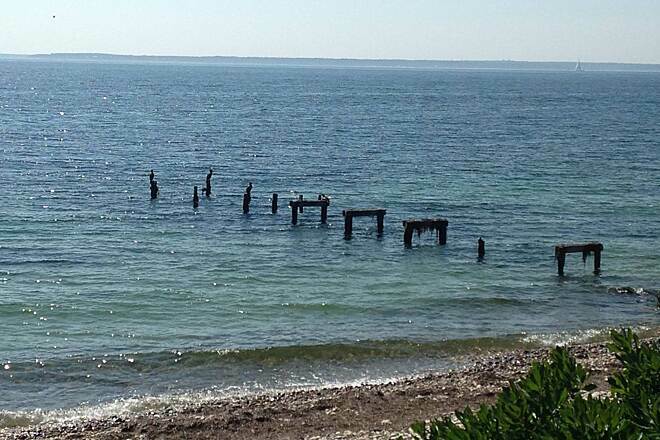 If you want a little more adventure plan a day, park at the Gilford Lot, ride to Woods Hole, hop on a ferry and ride on Martha's Vineyard trails. Bring a bell with you as there is a lot of mixed traffic but the path is great for bikers and kids. We always do a family trip and there are several places to park depending on how far you want to go. From end to end is 10+ miles. Parking is a couple of miles apart and easy to find. I highly recommend this for familes and a scenic ride. Be aware that there are several road crossings that are easily navigated. There are fountains on the path and port a potties as well. The path ends at the Steamship Authority after riding through the parking lot and there is bike parking as well, the steamship building is also at the end of the lot if you want tickets to MV. 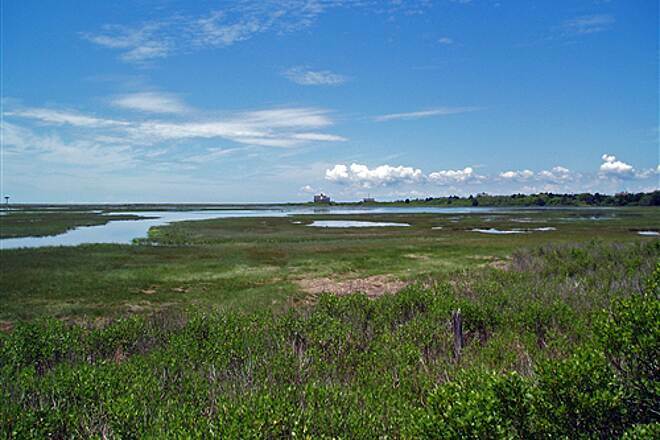 This trail offers various types of scenery including ocean, cranberry bogs, and marshlands. My husband and I started our ride in Falmouth. The parking lot is located across the street from the bus terminal on Depot Ave. We set our GPS to 1 Depot Ave. and found it very easily. 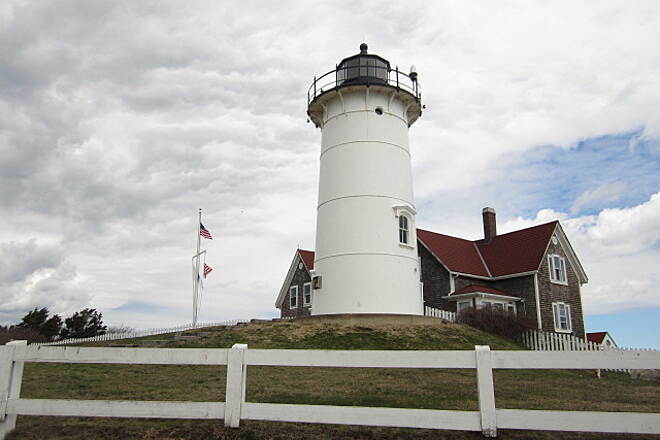 If you want to ride to Nobska Lighthouse at the Woods Hole end of the trail, turn right (not left, toward the ferries) and go up the hill (Woods Hole Rd.). In about a quarter mile, take a right on Church St. The lighthouse will come into view at the top of the hill. It's private so you can't go in; however, it's a picturesque scene and offers cliff views of the ocean. It adds about a mile to the trip. Once you leave the lighthouse, you don't have to go back the way you came. You can continue around the lighthouse. Within a half mile, you'll ride under the bikeway. Right after you go under it, look to your left. There's a paved ramp that gets you back up to the bikeway. 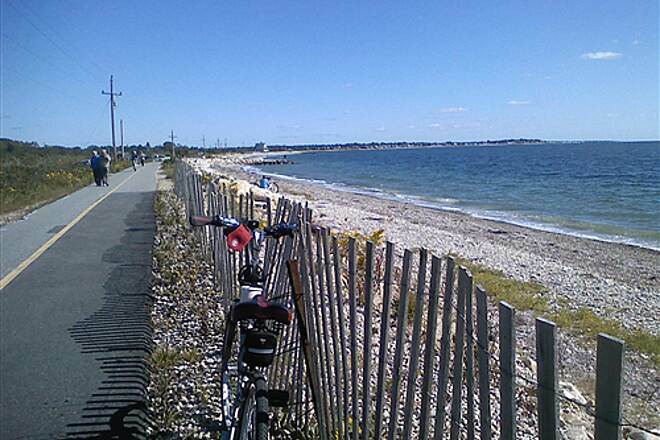 We rode 4 rail trails while on the Cape. All are reasonably flat and make for quick riding. I consider this one my favorite, as its the most picturesque. 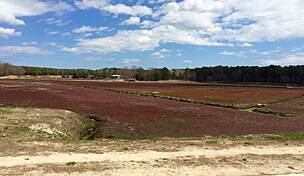 The cranberry harvest, egret nests, vast saltmarshes, a soda machine in the middle of nowhere, the Martha's Vinyard/Nantucket ferry terminal and the best pie place in the area are just a few of things a rider on the Shining Sea Bikeway can experience in the fall. Copy and past the link below to see the video. Very nice and can add on. Fantastic trail. No major hills and you can maintain a good pace the whole way. I come from the north and Woods Hole is a great place to explore before heading back. Ice cream is available and there is a nice beach along the way too. Even both ways, it is a little short for me, but you can park at the west Cape Cod Canal lot and add 7 or 8 miles (both ways) on very nice lightly traveled roads to the north trail head. If you want to add another 6.5 miles (both ways) use the east lot and ride the canal access road. If you ride with a south or southeast wind as is usual in the summer you have it at your back all the way back from Woods Hole. Can't beat that! This is an excellent trail. We rode this trail while on vacation in Cape Cod. The trail is paved, very scenic, and very clean. We rented bikes nearby and rode the trail on a Saturday morning in August. The trail was kind of crowded but that didn't prevent us from having a great time. It is a Cape Cod MUST do! Beautiful and varied terrain. Best bike trail plus it goes through a wildlife sanctuary. Lots of bunnies and catbirds, a beach and ends at the woods hole ferry. Copy and past link below for the full story and photos. Beautiful ride past the ocean and ponds and it is shaded for some portion! One of the best rail trails I have been on. Lots to see and it is beautiful! Did this bikeway a few weekends ago with the girlfriend for the first time. Pretty well maintained overall, except for the tree roots busting through the pavement in a few section--road bikes beware. 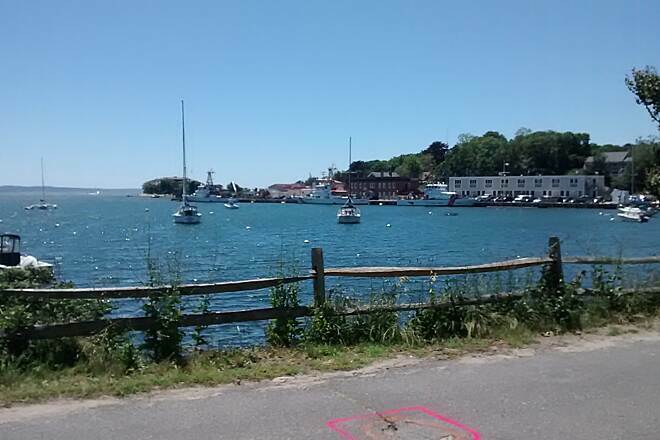 Beautiful scenery, fairly flat, and it ends in Woods Hole which, if you can lock your bike up, is a great place to stop and have lunch and sit by the water. Try the Deli in the center of town for amazing sandwiches! Though not very challenging, it is worth the ride down the Cape. Just beware of the zillions of tiny dogs, road bikers with million dollar carbon bikes whizzing past you (with no road manners, either), and the few vagrants who like to hang out on the trail. No, really, don't be scared! Tip: Get to the parking lots EARLY, since there's only a handful of spots. 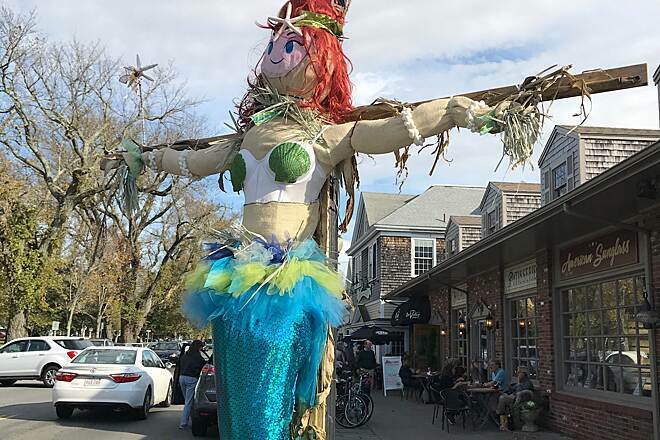 If you can't park, download the map, and find a quaint side street to park at and hop on the trail at one of the many inlets in North Falmouth! We rode this trial last weekend. We started at locust street and made our way to the shore and Woods Hole. This part of the trail is very busy and for good reason; it's beautiful! it's about one mile of coastline where you can sit and enjoy the fresh salt air and watch the waves. Beautiful cobblestone seashore with wild roses in full bloom. On the trial towards North Falmouth you can see the cranberry bogs and a few glimpses of the coast.Easy ride with our side by side trike. Just a slight incline. We did this trail today... Was beautiful. Started at the RT 151 trail end to the end at Woods Hole and back. Was a bit windy and uphill when you hit the last two miles of the trail from the ocean side to Woods Hole but we pedaled on. Was nice at our backs returning. Top 3, trail will do again. More ppl saying "hi" than others we've been on. We stopped at the Silver Lounge as a reward on the way back about .2 miles from the end. Was pleasant and staff was friendly. Do this trail. Lots of birds to see. My wife and I have been on several rail trails and this one far exceeds the ones we have been on. 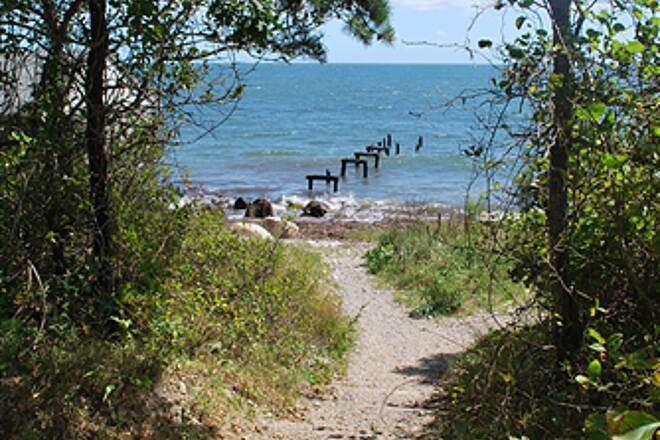 We love the ocean, this trail spills right onto a beach looking at Marthas Vineyard, you can literally drive your bike into the ocean. 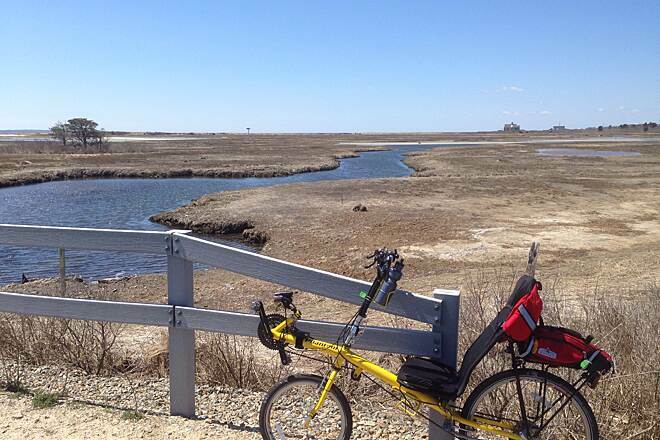 The trail begins in West Falmouth and also has some very scenic views of salt marsh and ocean. 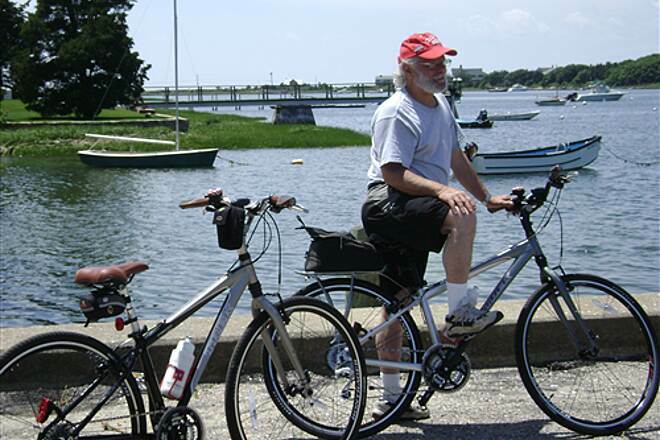 We once rode to Woods Hole and decide to take the ferry to the Vineyard and ride the vineyard, many options. This trail will be our top choice for some time to come. At first I was a little disappointed in the trail. We drove from Western Mass to ride it. Looking at the map and considering the name I thought we were going to have great coastal views. But most of it is tree lined. Making it shady, which is nice, but no views. The southern few miles are coastal and along a beach with great views. The trail is in good condition with several benches for breaks. It is heavily used in summer. 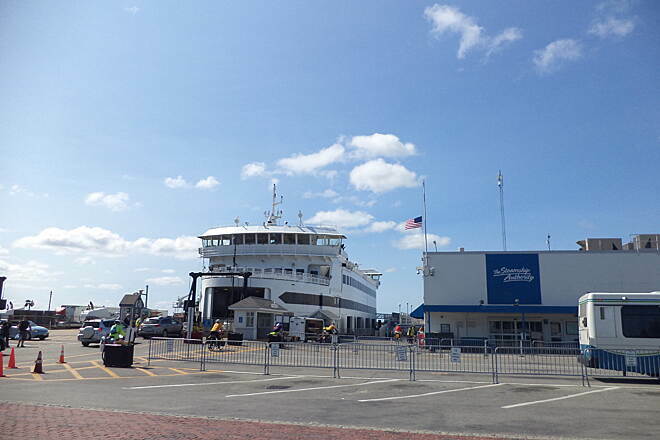 We made for a nice day by taking the ferry to Marthas Vineyard at the southern end of the trail. Rode a bit around the island, ate then came back. 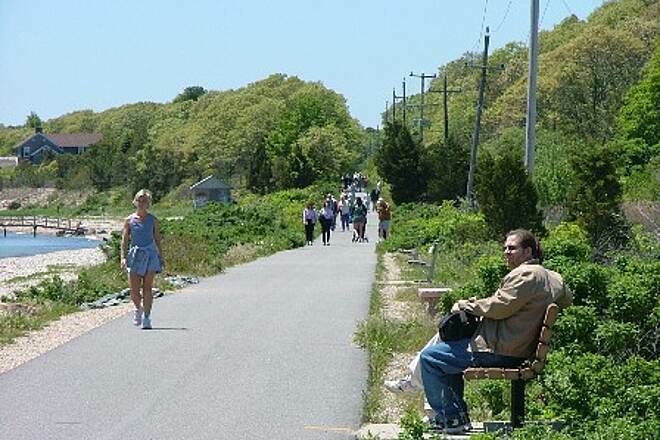 If youre going to make the trip from 2-3 hours away go to the Cape Cod Rail Trail. Its longer and lots of fun with spurs off it to the beach. Well worth the drive. 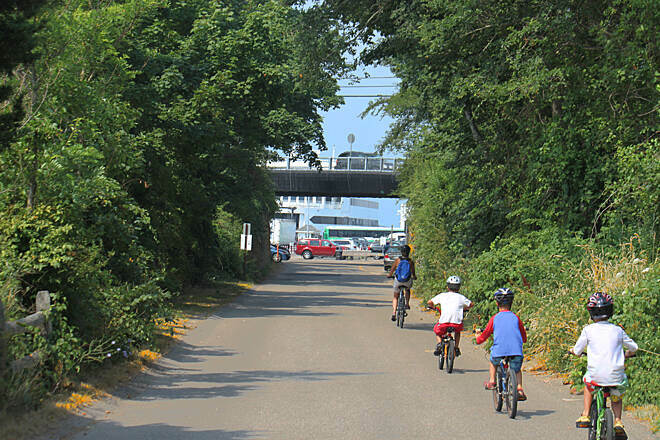 Is the Shining Sea Bike Trail still under construction? 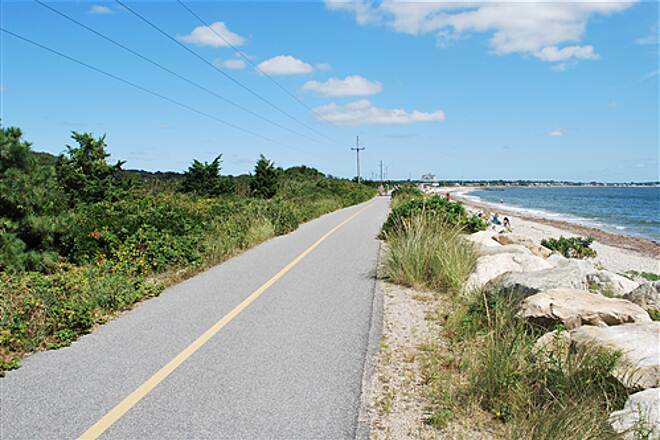 I love riding this bike trail when I am on Cape Cod. 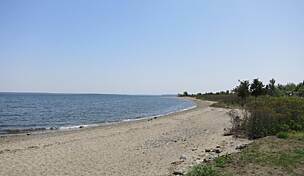 I was there in May and started at the northernmost point. I got only a few miles and the trail was closed for construction. I had to go back to my car and drive down to the next parking lot. According to the workmen that I encountered, they were installing a culvert so that the water could pass from one side of the trail to the other. I am wondering if construction is complete now and is the bike trail passable again??? If there is someone from the area, please let us all know. > Has anyone any idea or info about heading south on Church St (shortly after Little Harbor) to Nobska Rd to Fay Rd. Is the lighthouse on this point? Serious road cyclists might enjoy that 3.25 mile alternative (Woods Hole Rd, Church St, Nobska Rd, Oyster Pond Rd, Surf Dr) from the south end of the Bikeway to its 2.2 mile mark. 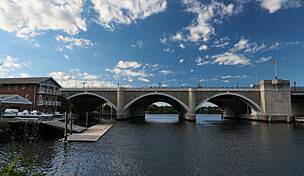 However I think that the 5.35 mile ride (Carlson Ln, (Old) Palmer Av, Sippewissett Rd, Quissett Rd, School St, Water St, Railroad Av) from about the 4.5 mile marker to the south end of the Bikeway would be much safer and enjoyable. One can always also make the side trip to Nobska Light, while in Woods Hole. 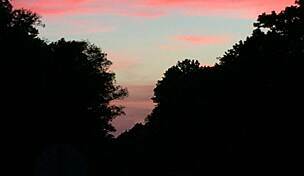 It continues as narrow and winding roads briefly along Vineyard Sound and then through woods, with limited sight distances for traffic. Nobska Rd crossing under the Bikeway (at the .7 mile marker) shortly becomes Oyster Pond Rd and finally Surf Dr. There are few (and unmarked) opportunities to rejoin the Bikeway until its 2.2 mile marker (just after Trunk River Beach) where it heads inland along Oyster Pond and then Salt Pond. I do not recommend Fay Rd, as it is a sunken, private dirt road behind private homes with many deep, often water filled ruts, doesn't offer any worthwhile water views, and only a few (also private) ways of getting back on the Bikeway. There is an additional Bike shop at the north end of the Shining Sea Bikeway that is not yet on the official map. just on the east side of the (active) railroad tracks from the parking lot at the north end of the Shining Sea Bikeway. shop is immediately on left. 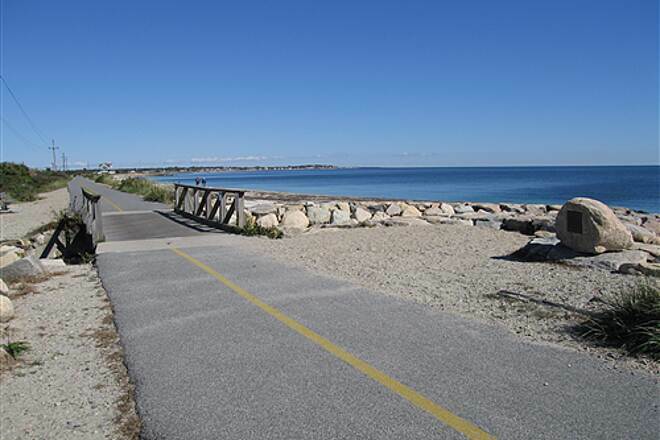 My wife and I rode this beautiful trail from the mid point to Woodshole and loved the level path and the closeness to the ocean. I would visit this path over and over again. My husband & I rode this beautiful trail a few weeks ago. I've read the other comments and liked petri's idea. The only disadvantage I see to that is missing the ride along the ocean (my favorite part.) Has anyone any idea or info about heading south on Church St (shortly after Little Harbor) to Nobska Rd to Fay Rd. Is the lighthouse on this point? 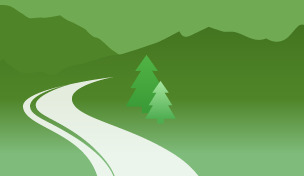 From the map, it looks like the trail crosses Fay Rd right before the "ocean ride". This looks like a good partial alternative from Woods Hole, but not being from the area, I'd like some local feedback. Thanks and happy riding. Great trail, but a shame it wasn't a "rail-WITH-trail"
The comment by Danbury Dave "...plans to add revitalized passenger service in 1994 from NYC, funded to millions, failed miserably." is utter nonsence. Review the Cape Cod Times news articles on the rail service in the 1980s and you'll see how popular this service was. Rails-to-trails on rail routes that have no future is a great idea. 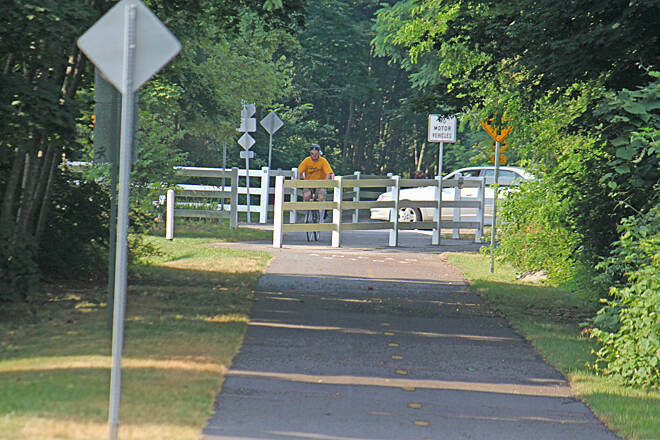 Forcing the abandonment of rail lines with potential does not help the rail trail cause. We rode the full length on Sunday, August 2nd starting at the northern end parking area on Rt. 151. Easy parking, excellent ride, beautiful trail. Highly recommended. Generally smooth paved surface terminating at the Woods Hole ferry parking area. It was wonderful to see the very young and the very old using the trail among the large number of people walking, jogging, roller blading and biking. Crowded, but not too crowded. A draft map can be found at http://www.capecodbiketrails.com/Map%20PDFs/bikeway_map_w_logos_draft2Jun09.pdf. A good partial alternate return from Woods Hole that we enjoyed was to take Quissett Ave. out of Woods Hole through the Country Club to Oyster Pond Road and use the latter to return to the bike trail. Shinning Sea Bikeway extension. Outstanding! I just has the pleasure on Sunday of riding the entire Shinning Sea Bikeway. Its almost 11 miles in all each way (I belive it is 10.6 miles from County Rd to Wood's Hole. 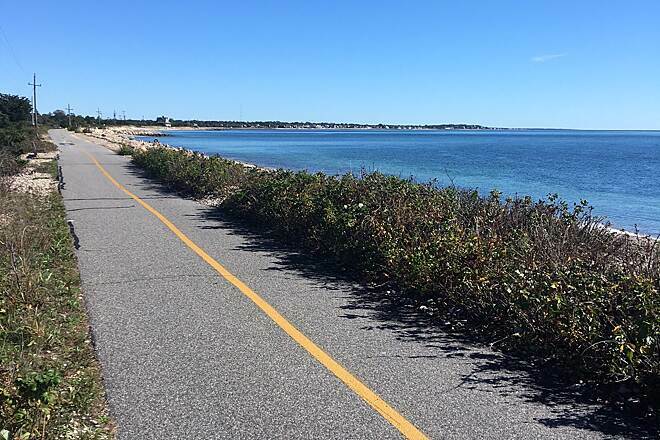 The old path from Locust St to Woods Hole was nice enough as it passes by the sea, but the new extension is the best rail trail I h ave had the pleasure to ride. The new pavement is outstanding, and it appears that the work done will allow for many years of good pedaling. I saw no signs of any potential roots, bumps etc that on other trails have had so much trouble. In fact, there is actual lnadscaping along much of the path. There are wonderful grassy areas, split rail fences and lookout points. 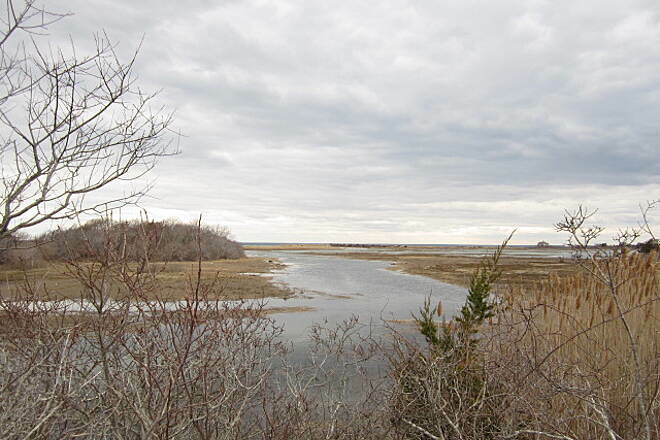 There are many views of the ocean (Buzzard's bay), bogs and meadows. Road crossings are few, especially for this part of the State. Where there are crossings there are Pizza shops, gas stations (for air), small general stores etc. At the present new trail head at County Rd there is an excellent Pizza shop across Rt 28A (Caution...wlak you bike. This is a dangerous 4 way highway intersection). The path from Locust St to Wood's Hole was lined with Beach Roses in full bloom, the air perfumed with their wonderful fragrence (yes..stop to smell the roses as they say). 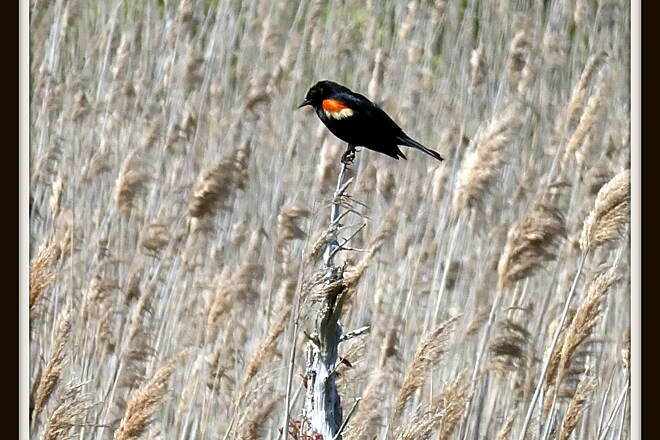 On the way North through North Falmouth we saw several herons and egrets and numerous red wing blackbirds. 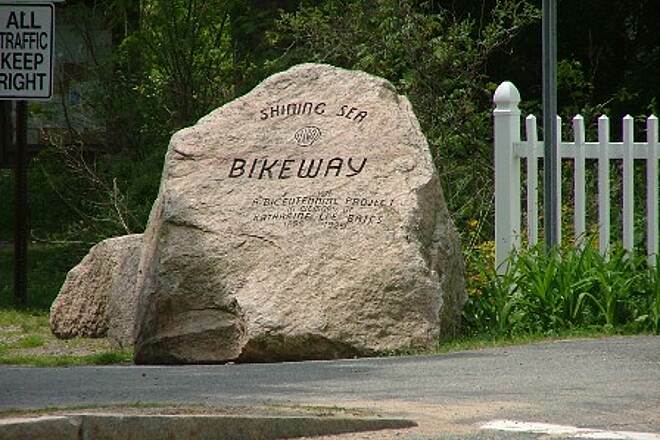 Unlike the rail trail out at the mid cape (Dennis-Wellfleet), there are no bike shops on the Shinning Sea Bike way. I imagine its only a matter of time since this is a new trail. There are shops in downtown Falmouth so check anything you need fixed before parking your car and using the trail. The trail is very wide, and we had no issues with avoinding walkers, joggers or skate boarders of which there were many. I understand that the trail is going to continue all the way up to the Cape Cod canal at some point. When that happens, it will be one amazing ride. On the way back south, it was near sunset and we were trated to wonderful sunset views and colors that crossed over the bay and marshes. the temperature was around 67, and the sky was cobalt blue..just a perfect day. i highly recomen this trail, and I am sure you will agree it may be the best trail in New Emgland. 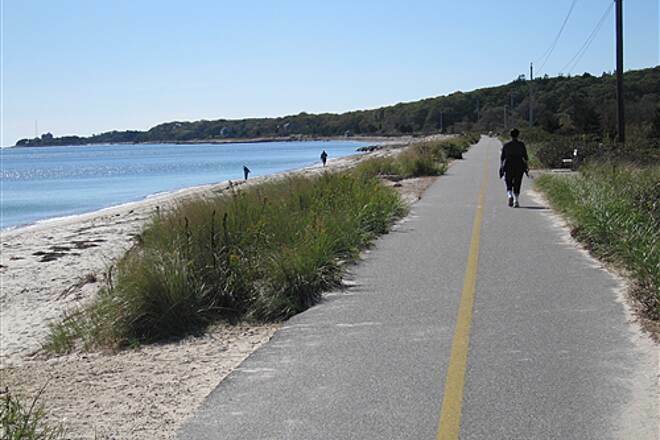 The Shining Sea Bikeway now begins in North Falmouth at County Rd (extension of MA-151 just west of MA-28A) to Falmouth Village and on to Woods Hole. The 6.5 mile extension officially opens Monday June 29, 2009, but it is paved and many are enjoying it now. Parking at Skating Lane is limited, but just south of there, closer to Falmouth Village, there is a large lot at Depot Av. Depot Av is the first right (at the Intergas gas station) on the way to Woods Hole, just 1/2 block south of where MA-28 South turns left (east), cross the bikeway and it is on the left - do not park at the Bus Station. The parking area on the north side of County Rd hasn't been paved yet, but should be usable. Please upate information about the Shining Sea -- Ext. 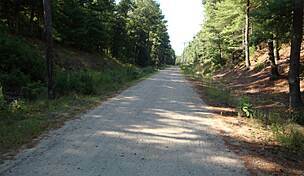 is paved into West Falmouth. "Great trail! 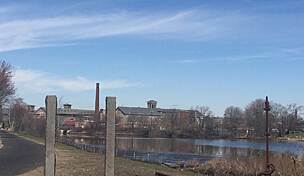 I rode this the other day from Falmouth (Center) near the bus (and formerly train) depot. They are doing work on the depot to touch it up. To the right is the platform, still intact. It actually starts there and behind it they were paving in the afternoon a .7 mile stretch to the north and past the Steamship Authority. Later on when they left, i rode it and it ended under an overpass. If you ride it south it's pretty smooth and it's a rail with trail but it's hard to tell if it was double tracked and you were riding on a former track or siding. The rails are in place for about 1/2 mile and then they disappear near some swamp. There are a few street crossings as well. Lots of use by many family members in the middle of the week on a very hot day. It crosses over a couple of very small creek bridges later. Then it goes into the small fishing and maritime town of Woods Hole, past the beach on the left and goes through more woods until it joins a parking lot for the tourists for the ferries. It actually becomes a striped yellow bike lane that weaves through the parking lot between rows of cars and ends where the ferries depart. A very nice trail. 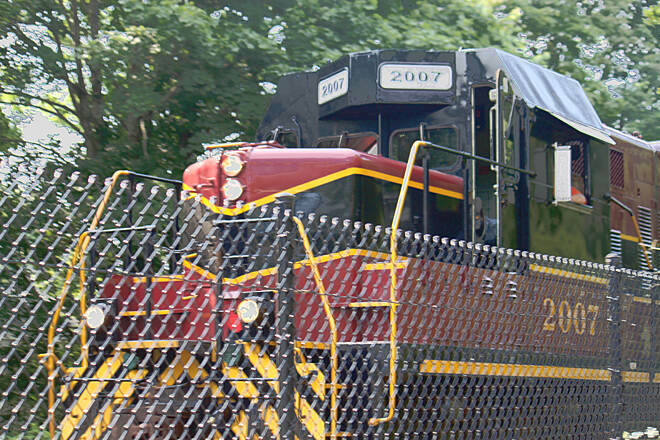 There's a huge history at the Woods Hole end detailing not only the history of the line but also the very detailed citizen activist history of trying to restore the rail line and acquiring the rail as trail. 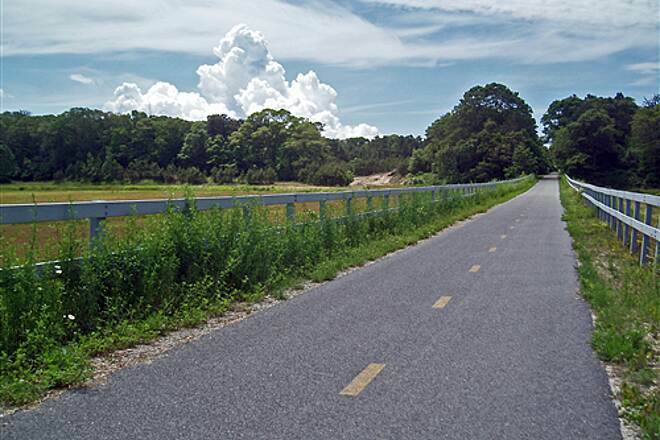 Of note: they now have secure funding for the extension of the trail, some 6.7 miles north to connect to Bourne where the Cape Cod Canal Bike trails traverses both sides of the canal. Freight ran on it until 1998 and plans to add revitalized passenger service in 1994 from NYC, funded to millions, failed miserably." 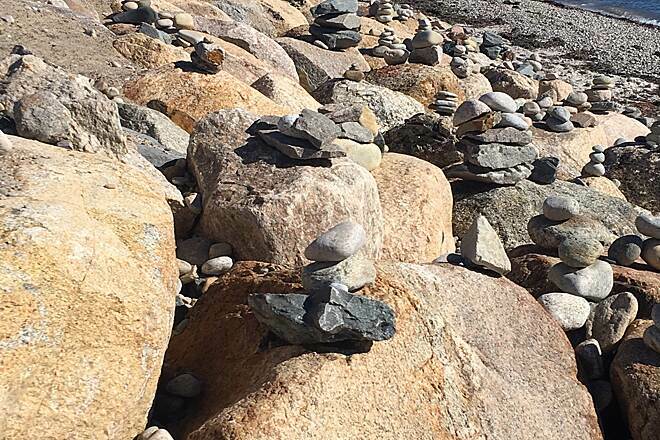 "Driving down to Woods Hole to go to Martha's Vineyard, my wife ""discovered"" this trail. We ended up parking at the Steamship Authority parking lot (right next to the trail) and took the path down to the ferry. Enroute we discovered we could have saved the $8 parking fee by parking at one of the free lots next to the trail." 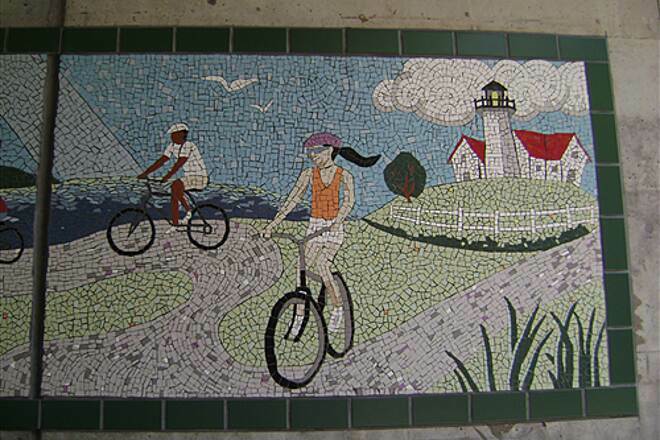 "Last summer, my husband and I had the pleasure of experiencing the Shining Sea Bikeway. It was beautiful! The path winds along the coast, revealing breathtaking views of the surf, sand and natural habitats. There was a small wooden bridge we passed over while pedaling through the tree-covered area of the path. Everyone we encountered on our ride was friendly and courtious. This one is definitely worth the ride."